If you would like KG weights, please click here. Updated with new artwork and a gloss-matte-gloss finish, Rogue Color LB Training 2.0 Plates are an IWF standard 450MM in diameter, with a narrow width that allows for more weight to be loaded on the bar. A 50.40MM collar opening and steel disc insert keep the plates firmly in place even during intense, high-rep training. These quality, color-coded bumpers represent the next generation in a series that’s been trusted in official Reebok CrossFit Games competition. With a tested Shore A durometer of 86, they minimize the bounce on the drop and won't break down with heavy use like some lesser plates on the market. The color coding of the LB Training Plates makes them easy to identify at a glance, helping athletes, trainers, and coaches run more efficient workouts. Red = 55LB, Blue = 45LB, Yellow = 35LB, and Green = 25LB. Use the column on the right to choose the plate pair(s) that meets your needs. 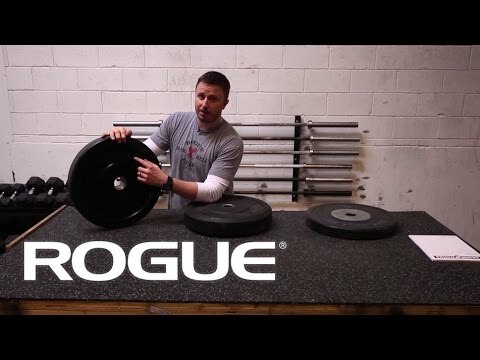 Rogue Color LB Training 2.0 Plates is rated 4.9 out of 5 by 26. Rated 5 out of 5 by WolfG85 from Great quality Exceeded my expectations when I recieved them! I will be buying another set down the road. Rated 4 out of 5 by Anonymous from APU Bumper Plate APU is new material, it has better performance than urethane with lower prices. Amphiphilic polyurethane thermoplastic elastomers are characterized by excellent wear resistance, excellent ozone resistance, high hardness, high strength, good elasticity, low temperature resistance, good oil resistance, chemical resistance and environmental resistance, the hydrolysis stability of poly-ether ester in wet environment is far more than that of polyester. If you are interested, pls contact me. Rated 5 out of 5 by B Barber from The Best!!! I have become a repeat customer and the quality continues to be of the highest. Rated 4 out of 5 by Leon from Things you need to be aware of These are some great bumper plates for sure, enough has been said about their pros. I'll focus on the cons only. - The center steel plate is a two-piece design. They are pressed together with 6 hex screws. This creates a split in the inner portion of the hole, causing the plates to rub against the barbell sleeves with lots of friction and unwanted noise. - These plates do not have raised lettering like the competition plates. The lettering is printed instead. - Another annoying problem is the rust development. I bought mine about two years ago, there is already a lot of visible rusts. In comparison, my Rogue competition plates are completely shiny with no rust at all. Rated 5 out of 5 by Pawnsauce from Amazing customer service and shipping AS ALWAYS I’ve been slowly putting my garage gym together for over the past couple years. I had about 500lbs in the rogue HG2.0 bumpers but have always wanted to covert to KG and get the nice Comp bumpers. Well I finally bit the bullet and got 235kg worth of Comp bumpers and their change plate set. Literally two days later most of it was at my door step and the following day the remaining arrived. Couldn’t of asked for much more than that. Thanks Rogue for being so dang awesome! Rated 5 out of 5 by Craiger777 from Excellent weights Everything from the quality to the delivery was 10/10! Awsome company and products. Rated 5 out of 5 by Saskadave from High quality and no smell These look awesome. Packaged very well. I am super sensitive to certain smells. So much so that my lungs get tight and I wheeze when I am around certain rubbers. These color bumpers have almost no smell at all right out of the box and I can breathe easy. Rated 5 out of 5 by rlozano from Good quality and look amazing I bought these a month ago and I’m enjoying them..